摘要 恶性肿瘤患者的血液中多存在高凝状态,其易形成血栓的高发生率可明显降低患者生存质量,并危及生命。通过临床观察发现,恶性肿瘤患者血液中存在的高凝状态临床表现与中医血瘀证基本相似。因此,活血化瘀治则可能在恶性肿瘤并发高凝状态的临床治疗中具有广阔的应用前景。 Hypercoagulation is common in patients with cancer,which influences the patients＇ quality of life,or even causes life-threaten by inducing high risk of venous thrombosis. 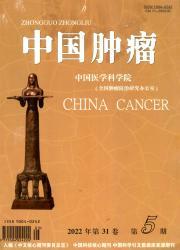 It is found that the clinical manifestations of hypercoagulation related to cancer are similar to blood stasis syndrome of TCM. Therefore,the rules of activating blood circulation to dissipate blood stasis may have very promising future in the treatment for hypercoagulation caused by cancer.